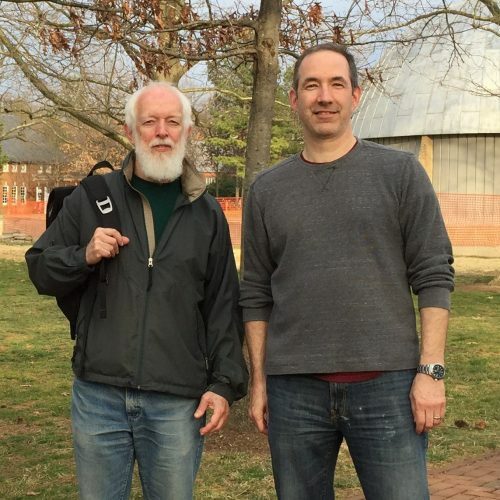 Dylan goes on location to St. John's College, Annapolis to talk with Stewart Umphrey about his book Natural Kinds and Genesis: The Classification of Material Entities (2016), with Mark and Wes lobbing in questions remotely. Are general terms like "water" or "dog" or even "chair" just things that we made up to order the world we experience? Aristotle thought that some universals (not "chair," but the other two) constitute natural kinds, with an internal structure that explains their behavior. This kind of talk was replaced with the scientific revolution with talk of laws instead of kinds, but Stewart wants to revive this notion, as well as the activity of "natural philosophy," which was what folks like Descartes and Newton considered themselves to be doing, but which subsequently stopped being a thing when the natural sciences broke off from philosophy. We all read chs. 1–5 and the epilogue, and each chapter focuses on a different topic: Ch. 1 covers the preconditions of natural philosophy, which include a rejection (as an assumption for inquiry, not as a final conclusion) of any kind of idealism and acceptance that there really is an external world apart from our cognition. Ch. 2 then covers universals: Stewart thinks it reasonable to hypothesize that these are real contra nominalism that says we just make up all of the concepts we use to organize things. Ch. 3 gets to continuants, which are things that we see as existing over time, even though their location, or many of their properties may change; his example is a particular squirrel, whereas "water" as a mass wouldn't qualify (though a particular water molecule would). Again, after considering the available positions pro and con re. the existence of his subject, he concludes that it's a reasonable bet that there are legitimate continuants. Finally, in ch. 4 he gets to natural kinds, which he argues constitute the essence of a continuant type, e.g., what makes a squirrel or water molecule what it is. His view entails that each continuant can only be one natural kind, so while "squirrel" may end up to be a natural kind, then "animal" or other nested categorizations would not be; those would be just concepts of convenience, not ultimate parts of our ontology. Dylan also read chs. 6 and 7, which bring in concrete examples from biology and physics, so these will be discussed in part 2. The purpose of caring about ontology in this way is to argue against the long-time scientific goal of reducing all of psychology to biology, all of biology to chemistry, and then to physics. Natural kinds would be irreducible elements in the ontology, not just things that came up in the course of the contingent (i.e., could have gone differently) history of science (contra Rorty). This is not to say that we might not be wrong about what we think the natural kinds are, but if there are some in the way that Stewart describes, then we can talk about real emergence in science: how biological organisms exhibit properties that can't be predicted by looking at things on a lower (e.g., chemical) level. This is one of our more difficult episodes, and it would certainly behoove you to listen to some of our previous discussions in metaphysics before tackling this one. For instance, ep. 130 on Aristotle's De Anima, ep. 126 on Saul Kripke, ep. 6 on Leibniz's monads, and ep 68. where we talked to David Chalmers about metaphysical reductionism. We've perhaps more often considered views that reject this kind of metaphysics, covering folks like Nelson Goodman, Whitehead, Dewey, and Kuhn (in addition to Rorty). Here's an article Wes wrote about the relationship between science and philosophy where he mentions Stewart. If you've got $45+ to spend on this, buy the book , or better yet, go get it from your local academic library. Update: Order the book at www.rowman.com and use the code LEX30AUTH17, you'll get 30% off your order. Continued on part 2, or get your ad-free, unbroken Citizen Edition now. Please support PEL! Sponsors: Get $50 off a new mattress by visiting casper.com/pel. See protectamerica.com/PEL to get $5 off monthly monitoring. Try generationtux.com and use offer code PEL for 20% off a suit/tux rental. Get a free trial shaving kit (paying only shipping) at harrys.com/pel. I could have missed it – there was more technical terminology in this episode than usual, and I was flipping back and forth on the recording – but could someone possibly given several concrete examples of the ‘endurants ‘ and ‘perdurants’ spoken to in the first half of the show? A molecule of water was brought up as a good example of a ‘continuant’, but I’m not sure about how perdurants might cash out for us in our lived experience… if they in fact do. Thank you. Perdurant is just a different way (not Stewart’s) of analyzing the same thing: instead of saying “here is an entity existing in three-dimensions that persists over time” you say “here is a 4-dimensional entity.” So any individual person, e.g. could be analyzed as either, but we didn’t get into the details of what it would mean to consider you a perdurant. Stewart said in response to my joke that he didn’t think a perdurant could be “happy,” presumably because an emotion is a temporary thing and not an overall characteristic of an organism… but I took Solon’s point to be that happiness is NOT an emotion, but an overall assessment of a life, in which case it does seem to apply to perdurants. But I would suggest you just do some research on the web about it, as Stewart said it wasn’t a distinction he made up and didn’t dwell on it either in our discussion or in the book. I’m actually unclear re. whether there’s any difference between “endurant” and “continuant.” They seem like the same thing. They’re perhaps not best illustrated by giving examples just because part of the point of the inquiry is to figure out what constitutes a legitimate continuant. Right. I’m tracking, Mark; thanks. I want to listen to the Axons and Axioms episode link that’s recommended here in the comments thread first, and then maybe circle back to endurant and perdurant on the web. It just seems strange to posit a human being as possessing four dimensions. On the other hand, if you are trying to account for the wholeness of a life, perhaps it’s imaginative to think of the organism existing not consecutively in so many discrete, linear segments of time, but rather as that same duration of time being inherent to the continuant (i.e. this human being)? Still a little fuzzy for me. Thank God. I was worried you were rebranding to Partially Examined Politics. Unfortunately for those of us who aren’t that interested in politics, it is one of the most popular branches of philosophy. Just a quick browse on philpapers.org, for example, shows how popular political philosophy is compared to other branches. PEL caught political fever around October/November: Burke, Tocqueville, the political free form episode, Orwell, white privilege, the race episode, the upcoming one on Islam that will probably get political, as well as a bunch of political blog posts on trump, identity politics and effective action, etc. And check out the number of comments here: Rorty on epistemology and mind-body got 16 and 20 respectively, while Rorty on politics got 127. Poor old boethius got 6 comments. I did enjoy the political episodes that had more philosophical meat on the bones, like the Sandel, Rawls, Nozick, etc., etc. Anyway, this is kind of like a fan wanting his favorite band to play his favorite songs, and I understand plenty of people loved the recent political ones I could barely sit through. I’m also glad the best philosophy podcast of all time gave us this latest gem, Episode 163. It was absolutely absorbing and not one word was wasted in the 2 hours. Also the guest Stewart Umphrey is awesome, just ordered his book on natural kinds. I think the grouchiness comes from the fact that many of us don’t consider (identity) politics to be a philosophical genre at all. “How contrite should white folks feel about having the privilege of whiteness? Super contrite or super-duper contrite?” hardly ranks among the great philosophical questions. I’m not even making a straw-man here – Wes was the only one to raise the (obvious) question of whether contrition was on the table at all. I applauded Wes for staking out his position in the White Privilege episode, incidentally, but I’ve also seen statistics reported (in more than one place) that the study of Philosophy overall is dominated by individuals from a particular identity group (i.e. white and male and heterosexual). Is it even modestly possible that this disproportionality makes bringing social epistemology, or identity politics, into the conceptual tent a little bit harder? I’m not asking polemically, by the way. I don’t wish to re-litigate Episodes #161 and 162; merely curious on what grounds identity politics fails to be a legitimate philosophical genre where other sub-disciplines (like, say, regular Political Philosophy) do. Just popping in to say that I thought this episode was awesome. And a great antidote to the recent politics oriented podcasts. It’s pretty technical, so my habit of listening while I work isn’t cutting it. I’m going to have to listen to this several times, and I’ll enjoy it each time. Stewart is a captivating speaker. I heard through the grapevine that this might be due to skillful editing, in which case I offer my kudos to the editors. Well done. I have been catching up on episodes after quite a long time. This one was interesting and is worthy of a second listen–or just read the book. Umphrey’s speaking style is remarkably similar to what one would expect to read in an academic paper. It’s interesting to listen to someone who keeps track of positions, caveats and jargon to such a remarkable degree. I agree it was a good antidote to the political discussions, but in defense of PEL I would say I very much appreciated the time spent on the subject. If it seemed like a multi-part therapy session, it was one that I was in need of myself. If “dog” is a kind then I don’t see why :”chair” isn’t. Not sure what “natural” really adds. I suppose if chairs could mate and make more chairs then they would be natural?